Our Classic Homestyle Muffin Mix might make the all-time perfect muffin. The muffins are light and tender, and have a beautiful texture and flavor. They mound up when they bake and come out of the oven with perfectly rounded domes rising above the top of the muffin pan. Each of our muffin mixes are base mixes. You add butter, eggs, and buttermilk or yogurt to the mix to make the base batter. You can add a variety of other ingredients including extracts, spices, nuts, fruits (fresh, frozen, or dried), and zests to make different flavors. Whatever you imagine you can make. Do you want a classic Blueberry or Cranberry Orange Muffin? 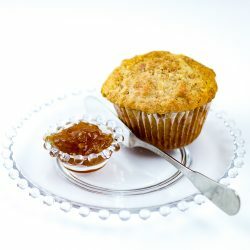 Or something more complex, such as a Vanilla Bean muffin topped with a brown sugar cinnamon streusel? Or something even further afield, such as a Pumpkin or Lemon Ricotta muffin? All of these flavors can be made with our Classic Homestyle Muffin Mix, and some basic recipes come with each order. You can freeze your muffin batter in paper lined muffin pans, and bake at a later time. Click here to read more about freezing muffin batter.